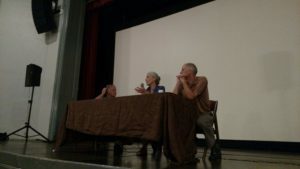 This past week Sustainable Woodstock, in collaboration with the Sierra Club Upper Valley Group, and Pentangle, hosted a screening of the newly released documentary, BURNED. Are tree the New Coal? The filmmakers and producers joined us for a post screening panel discussion. DISCLAIMER the contents of the film and in this article describe extreme examples of bad practices from the forest products industry, which is not necessarily reflective of forestry practices in VT, and especially for wood heat. In many cases, forestry practices in Vermont are very sustainable and should be an example of how other states should manage their forests. Filmmakers Alan Dater, Lisa Mertons, and Chris Hardee answer questions during a panel discussion. BURNED is a documentary that explores the wood to energy industry in the U.S. by specifically looking into three operations across the U.S. The film works to debunk myths propagated by the forest products industry about wood being carbon neutral. It also explores how policies in the European Union are leading to deforestation in the southern U.S., and global activism working to stop these types of practices. BURNED was produced by Marlboro Productions which is based in Marlboro, VT. The screening of BURNED in Woodstock was part of the “Barn Brainstorming” tour which has so far taken them to venues in North Carolina, Georgia, Louisiana, Maryland, and Michigan. Even before the film screened we ran into opposition from proponents of modern wood heat who were afraid of being put on the defensive despite the film not being about burning wood for heat. The documentary instead focused on industrial deforestation for the production of wood pellets to be shipped abroad to facilities in the European Union, and specifically the United Kingdom, where the wood pellets were burned to create electricity. So while the film did not talk about burning wood for heat, it was a warning about how myths around wood burning being carbon neutral can lead to bad practices of deforestation. Policies in the U.K. recognize burning wood for electrical generation as being carbon neutral because of an error made in calculating how new tree growth offsets the carbon footprint of burning them. This has led the many formerly coal burning power plants to start burning wood pellets. In order for U.S. wood pellet manufacturers to keep up with the massive demand of these facilities, they are not using sustainable forestry practices. Wood pellets are typically described by manufacturers as being from the debris left over from the harvesting of trees for lumber. The film showed that wood pellet companies are harvesting whole trees and deforesting large areas of land and replanting the area with a single tree species which is destroying the natural ecosystem. In addition to bad forestry practices in the South, in the Upper Peninsula in Michigan, residents are dealing with air pollution from an incinerator, which is burning chipped railroad ties covered in chemicals. In Berlin, NH residents struggle with the idea of creating jobs by bringing in wood pellet manufacturer or focusing on a local economy. Meanwhile wood products industry lobbyists continue to push the myth that burning trees is carbon neutral leading to massive subsidies from the federal government and states, which continue to drive this industry and exacerbates the problem. The discussion after the film was lively. There was a great turn out of people including several foresters and loggers who rightfully pointed out that what they do in VT is different from what is done in the south. John Dumas from Hartland pointed out that there are many foresters and loggers in VT who are very vigilant about making sure that they are using healthy forestry practices. This sparked a debate amongst the panelists and audience about what is sustainable. Vermont is seeing a decline in its forest coverage for the first time in 100 years according to a 2016 USDA report on Vermont Forests, but this is primarily due to development. The most important and poignant question of the night, in my opinion, was “what do we do to replace burning wood for electricity?” The answer to this of course is to create more renewable energy resources like wind and solar. The longer we wait to create renewable energy resources to meet all of our electrical needs the more we will see deforestation, pollution and monoculture from wood pellet production. JUST DO ONE THING. Invest in Renewable Energy! Imagine 500 rubber duckies racing down the Ottaquechee River in a mad dash to the finish. Whose ducky will win the race? Come find out at Woodstock’s second annual Duck Derby on Saturday, July 21. The event helps raise money for Sustainable Woodstock’s East End project. 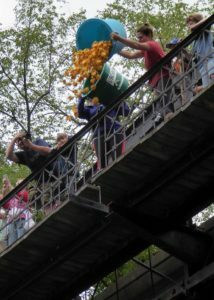 At 10 a.m. spectators will gather at Elm Street Bridge, in the center of Woodstock, to watch as bucketloads of yellow duckies are dropped into the rushing waters of the Ottaquechee River. The excitement will build as the “racers” bob down the river to the finish line at East End Park. Don’t worry if your ducky loses his or her way; “duck wranglers” will stand along the shoreline and in the river to redirect any wayward racers. The first-place finishers will receive a prize donated by Woodstock businesses. The great race culminates with a community Party in the Park, featuring live music, food, games, and activities for kids. Attendees are encouraged to bring a picnic lunch. Sustainable Woodstock will serve cake for dessert. The event wraps up at 1 p.m. The next Carbon Work-Study Discussion will take place on Saturday, July 21, from 1:30 to 3:30 p.m., at the Forest Center at Marsh Billings Rockefeller National Historical Park. Ashley Lang, PhD, will talk about the role of mushrooms in our forests. Lang is a candidate in the Ecology, Evolution, Ecosystems, and Society graduate program at Dartmouth College. She will discuss the two main kinds of fungi in forests (decomposers and mycorrhizal fungi), how they operate, how they impact soil carbon storage, and how much carbon they sequester in soil compared to carbon released to the atmosphere from human activity. We will also discuss how different ecosystems have different amounts of soil carbon and why. This workshop is part of an 8-month long series focused on managing forests for carbon storage and sequestration sponsored by Sustainable Woodstock and the National Park Service. Everyone is welcome and the workshop is free. RSVP with Zach@sustainablewoodstock.org to receive the suggested reading materials or to learn about other upcoming discussion topics on carbon. On Saturday June 16th, while everyone else was watching the hot air balloons launch in Quechee, a mix of land owners, conservationist, foresters, and environmentalists gathered at the Forest Center at the Marsh-Billings-Rockefeller National Historic Park. They gathered as they have been gathering for the last 6 months on the 3rd Saturday of the month for Sustainable Woodstock’s “Carbon Work-Study Discussion Group.” This month they met to hear a presentation from Dr. William Keeton about a recently released report, which he collaborated on, Forest Carbon Market Analysis and Assessment of Opportunities for Vermont’s Private Forestland Owners. Previously the group had discussed the history of forest management and different perspectives of the forest from a landowner, logger, and forester. The group also learned about compliance and voluntary carbon markets, about the importance of land management in order to prevent forest fragmentation and parcelisation, and discussed VT’s Use Value Appraisal(UVA) program. All of this so that the group could fully understand this month’s presentation. This month’s presenter was Dr. William Keeton, director of the Carbon Dynamics Laboratory, Rubenstein School of Environment and Natural Resources at UVM. When learning about forest management for carbon storage and sequestration it is almost inevitable that readers will come across Keeton. For more than 15 years, Keeton has been researching the carbon dynamics in forests with monitoring plots in Jericho and Woodstock, VT.
Last August Keeton presented on his research and gave tours of his monitoring plot on Mt Tom to a group of 60 people, majority of which had not learned about science since high school. Interest in the event led to a longer series designed to explore the intricacies of how and why to manage forests for carbon. 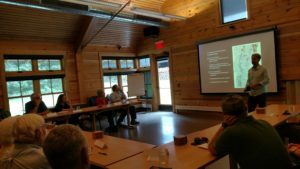 For this reason, Sustainable Woodstock with support from the National Park Service, VT Coverts, and the VT Woodlands association developed an 8-month long work-study group about carbon. Dr. Keeton, William VanDoren, Charles Kerchner, and Mackenzie Fuqua wrote the report. The “Forest Carbon Market Analysis” report is an in-depth look at Vermont forest’s feasibility for entering into the carbon market, and makes a strong argument for why Vermont should be more active in the carbon market. The gist of the presentation was that the rest of the world and especially China are aggressively pursuing and participating in carbon markets and that Vermont is not, but should be because landowners can make more money from their land and create additional benefits including flood resiliency and protecting forest blocs. In Vermont, landowners have the potential of earning net revenues of $943,284 over ten years, after expenses, from managing their forests for carbon. Skepticism of how a state, which is already over 80% forested, can increase carbon sequestration to such an extent that it would be profitable enough to sell on the carbon market has led to VT’s lackluster presence in the carbon market. Keeton explained that fixed costs for carbon measurement practices require larger parcels of managed land, 5,000 acres or more, in order to earn revenues. Private landowners with 5,000 or more acres of land, of which there are six in VT, have the option of developing a carbon project and selling the credits into the California Air Resource Board’s (CARB) cap-and-trade program. Landowners with smaller parcels are able to aggregate their forests with adjacent properties and sell carbon credits into the voluntary carbon markets. The report identified 140,000 acres of VT woodlands not yet conserved, which have the greatest potential for revenues, and 328,461 acres of land with 500 acres or more and at least 450 acres of which are forested. Concisely, Vermont is ripe for managing our forests for carbon. Carbon management plans help conserve land, create flood resiliency, and preserve larger forests blocs. With these additional benefits in mind, which also have huge financial benefits including decreased property tax rates from our UVA policy, and savings from storm and flooding mitigation, and revenues from selling carbon credits, managing forests for carbon in Vermont is not only feasible but should also be very attractive for Vermont landowners. Keep an eye out for events this Fall in Woodstock for the release of Dr. Keeton’s new book, Ecology and Recovery of Eastern Old-Growth Forests. 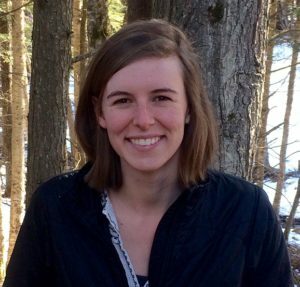 Also join us on July 21st 1:30-3:00 at the Forest Center of Marsh-Billings Rockefeller National Historic park for a presentation by Dartmouth graduate student Ashley Lang about the role of fungi in sequestering and storing carbon in our next Carbon Work-study Discussion Group! Just Do One Thing: Attend a Carbon Work-Study discussion. We have the freedom to choose from countless products to clean our home. If you are like me, I want the cleaner to do the job of removing dirt and grime, mold and bacteria, musty smells and worse. I also would like to preserve the health of my family, myself, my pets, and my environment. Is this a possible choice? Most cleaning products out there contain chemicals and toxins: formaldehyde, chloroform, styrene, and triclosan, just to name a few. Red flag: the fragrance of these chemicals will knock you out as you walk down the cleaning supply aisle of your favorite super market. I will argue that you don’t even need to walk down that aisle to purchase two simple cleaners that are just as effective, cost a fraction of the price, and are natural, non-toxic, and will not harm our natural environment. 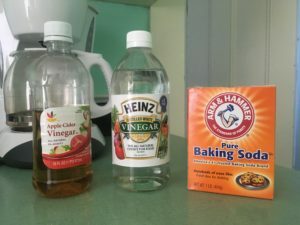 These cleaning agents are baking soda and vinegar (both white and apple cider vinegar will do). Sodium bicarbonate (baking soda) is a salt composed of sodium ions and bicarbonate ions. The natural form is mahcolite, a component of the mineral natron found dissolved in many mineral springs. Baking soda helps regulate pH; it keeps a substance neither too acidic nor too alkaline. It has the ability to retard further changes in the pH balance, known as buffering. This dual capacity of neutralizing and buffering allows baking soda to do things such as neutralize acidic odors (like in the fridge) as well as maintain neutral pH (like in your laundry water, which helps boost your detergents power). Baking soda works well as a deodorizer, surface soft-scrub, oven cleaner, non-wood floor cleaner (1/2 cup baking soda to a bucket of warm water). You can clean your dishes, pots and pans; freshen your sponges and shower curtains; make a hand cleaner (three parts baking soda to one part water); and clean your brushes and combs (1 tsp baking soda to basin of warm water). Baking soda can be ingested as it is used for baking and is an effective antacid to treat heartburn. Vinegar consists of about 5-20 percent acetic acid, water, and trace chemicals that may include flavorings. Acetic acid is produced by the fermentation of ethanol by acetic acid bacteria. Dilution with water is recommended for safety and to avoid damaging the surfaces being cleaned. The acidity of vinegar dissolves mineral deposits from glass, coffee makers, and other smooth surfaces. Use vinegar for cleaning shower door and windows (dilute with water and apply to crumpled newspaper for best results). Use vinegar for polishing brass or bronze, silver, and copper. It is effective in removing clogs from drains (even more so if directly poured onto 3 tbsp of baking soda placed over the drain), ungluing sticker-type price tags, and cleaning non-wood floors (1/2 cup white vinegar to ½ gallon warm water. Floors have the greatest surface area of your house; your pets and toddlers basically live there. Why not use the least toxic cleaner? Apple cider vinegar claims to have antibacterial properties. Combine 1/2 cup of vinegar with 1 cup of water to create your own all-purpose cleaner. Fruit flies a problem? No worries! Fill a cup with apple cider vinegar and a couple of drops of dish soap and leave on the counter and watch the flies accumulate and die in the solution. Other uses: clean dental appliances or your toothbrush, or use it as a detangler for your hair that also removes product buildup and creates shine. So many choices! Let’s do one thing: This summer let’s all try to limit our use of chemicals in our own home. Let’s choose the products that not only disinfect and deodorize but also are environmentally and human-health friendly.